THE GENERAL PUBLIC IS NOT AS FAMILIAR WITH ANNA GOLUBKINA'S RELIEFS AS WITH HER SCULPTURES. IN FACT, OUTSIDE SPECIALIST CIRCLES, THEIR EXISTENCE IS HARDLY KNOWN. 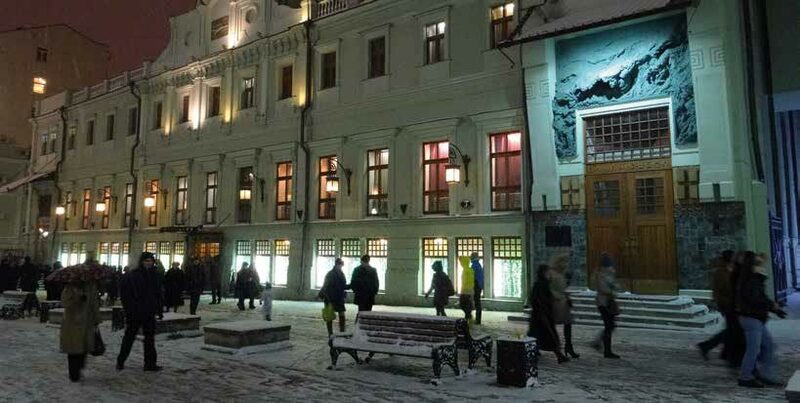 HOWEVER, IT IS CLEAR THAT GOLUBKINA'S RELIEFS, SO DIVERSE IN TERMS OF THEIR SUBJECT MATTER AND STYLE, AS WELL AS THEIR ARTISTIC GOALS AND INNOVATIVE IMPLEMENTATION, OCCUPY AN IMPORTANT PLACE IN RUSSIAN CULTURE OF THE LATE 19TH-EARLY 20TH CENTURIES. MODERN SCULPTORS HAVE DRAWN ON AND EXPANDED ON GOLUBKINA'S DISCOVERIES AND ACHIEVEMENTS IN BUILDING RELIEFS WIDELY AND WITHOUT RESTRAINT. ARTISTS ARE NO LONGER REQUIRED TO FOLLOW THE CLASSICAL CANONS OF RELIEF SCULPTURE UNCONDITIONALLY AND PRECISELY. 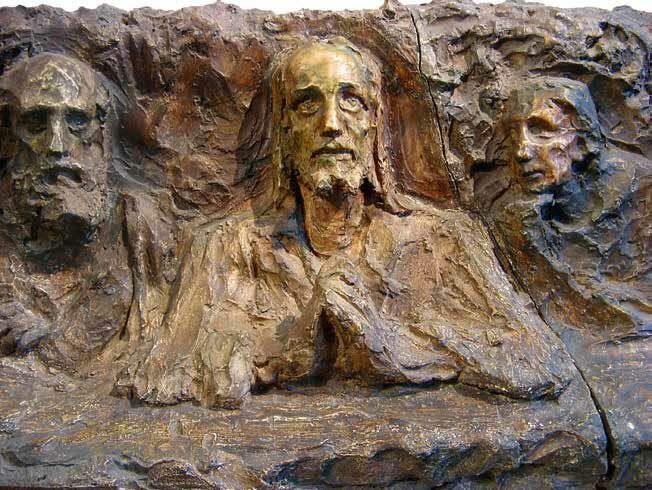 NEVERTHELESS, THE ACCOMPLISHMENTS OF THIS RUSSIAN SCULPTOR, WHO LED THE WAY TOWARDS A NEW ART THAT WOULD BE FREE FROM RIGID ACADEMIC CLICHES, HAVE YET TO BE FULLY ACKNOWLEDGED. 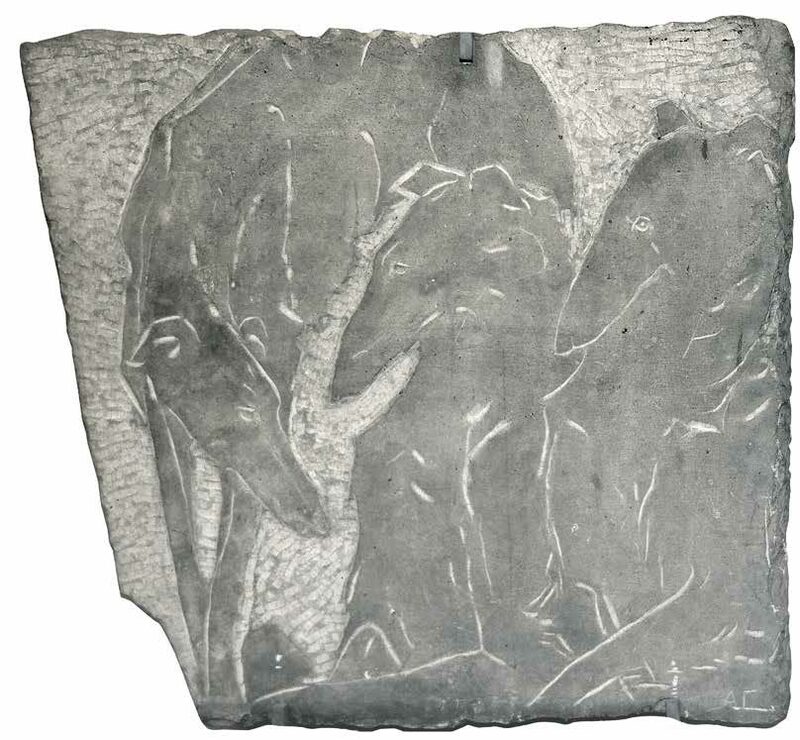 Golubkina's reliefs may be considered a testament to that momentous time in the history of the plastic arts when more complex themes and subject matter were emerging, and consequently new means of artistic expression and techniques were being discovered. The new understanding of the relief and its structure as an art form manifested itself in a new relationship between sculptural and pictorial attributes, between what could be touched and what could be seen, in a stronger interaction between the bulk of the relief and the surrounding light and air, and in a more powerful emotional connection between the artwork and the viewer. The astonishingly difficult undertaking of creating "The Swimmer" began with the three versions of the title that the sculptor considered ("The Sea of Human Life", "The Wave", and "The Swimmer") as the three hypostases of the image. The first one drew attention to the landscape, the second transferred it to the expressive shape of the wave, which cut the relief panel into two parts (one in which sculptural forms prevailed, the other with a perspective composition); the third one put the emphasis on the swimmer and his battle with the forces of nature. Even the titles themselves invited the viewer to experience the magnitude and fullness of the visual, changing emotional perception, from the distant perspective to the touch of the figures in the front of the relief. 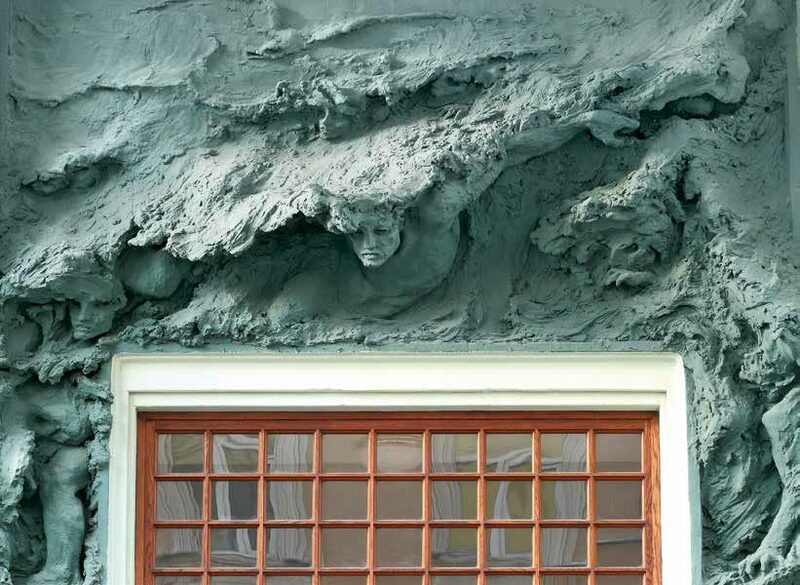 Golubkina chose to construct her image in high relief, as opposed to the traditional bas-relief panel, having considered the building's function, rhythms and the direction of the passers-by in Kamergersky Pereulok, as well as the distinct psychology of theatre-goers. It was in this relief that the sculptor was first able to bring together confidently the expressive sculptural forms at the forefront of the relief, with their complex foreshortening, and the gradual perspectives of the background. When Kamensky cited Ghiberti's name, he was clearly thinking of the Renaissance sculptor's most celebrated creation, his "Gates of Paradise", the third set of doors for the Florence Baptistery. In that the sculptor incorporated the practice of using perspective in reliefs that had already been formulated and tested by Brunelleschi and Donatello. Golubkina's style is really reminiscent of that of Donatello: he boldly broke away from tradition and moved from one pioneering artistic solution to another, quite unlike Ghiberti, with his serene, balanced technique and lasting connection to the jeweller's craft. Even though both of these Quattrocento sculptors cultivated the so-called "low relief" of a more "painterly" kind, it is clear that Donatello's non-finite style appealed to Golubkina much more than the meticulously executed and refined reliefs of the famous Baptistery doors. 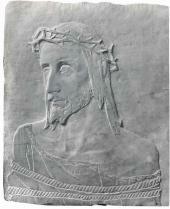 Throughout his career Donatello worked on constructing multi-plane low reliefs in perspective. Golubkina took this challenge further: she was equally captivated by the possibilities offered by the multi-plane and single-plane, perspective and orthogonal reliefs, and by compositions evoking classical harmony and clarity - and those that combined various different approaches. Reliefs of both monumental-decorative function as well as those created simply as individual works of art were similarly interesting to her. It was not just this form of plastic art, enclosed between two planes, that fascinated the sculptor: it was also its ability to interact with the atmosphere around it and impact on the viewer's senses without losing a sense of shape-generating power. There was a time when even Brunelleschi did not appreciate Donatello's achievements in creating low reliefs; to Brunelleschi, the plane of the wall was a treasure in itself, and disrupting its integrity was unacceptable. By overcoming the neutrality of Gothic high reliefs, well defined against a smooth surface, Donatello became the first artist to bring the relief closer to a painting, the composition of which is based on perspective, by using the so-called shallow relief, or rilievo schiacciato. Thus, the sculptor achieved a virtuoso gradation of volumes. In spite of all the differences in the way Brunelleschi and Donatello understood architecture, both of them were fighting for new artistic values, and are consequently often seen as kindred spirits. Golubkina, as she strived to realize original and spontaneous artistic expression through her reliefs, remained a virtual enigma to her contemporaries. Her short theses on the subject of creating perspective low reliefs, published among other essays in her 1923 work "A Few Words on the Sculptor's Craft", is first and foremost an attempt to protect and maintain the right of different kinds of sculptural relief to exist as part of the art form. The thesis also reminds the reader of the artist's method: a creative idea is realized through those artistic means that serve its purpose in the most precise and artistic manner. 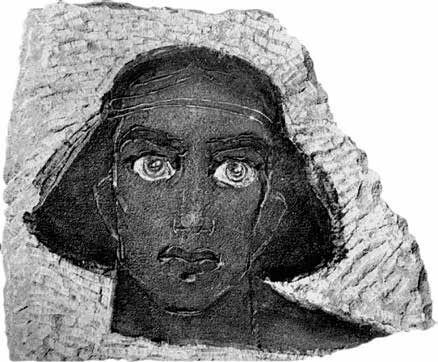 Golubkina wrote: "A relief is somewhat like a drawing: it is as if you were painting with clay, and your most important task when creating a relief is to maintain the same scale of reduction and perspective..."2. She clearly did not mean the use of pictorial means literally, but rather wanted to draw attention to the challenge both painters and sculptors share, that of perspective and plane gradation. Low relief is usually credited with "balancing" between sculpture and painting. The relief's special place as a kind of sculpture that is always associated with a flat surface presumes somehow that it is akin to painting and drawing. At different times, the quality and force of the convergence that these art forms experienced was expressed in different ways. Once again, this aspect became important for the evolution of art at the turn of the 19th and 20th centuries. Exploring the possibilities of low relief, Golubkina searched for her own artistic voice, one that would give life to her images. Meanwhile, the sculptor did not confine herself to this one type of relief; even though the new kinds of reliefs that she was making have not been categorized to this day, the direction of her artistic quest is perfectly clear from every one of the works she created. 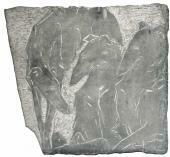 It was no coincidence that Golubkina kept returning to landscape motifs in her reliefs. Landscape, with its spectacular ability to reveal itself through the categories of depth, width and vastness, seems to be a natural ally of the sculptor in creating the relief's new space. That said, landscape's role in generating new forms is played out differently in different works. "The Sea of Human Life" and "The Marsh" are the sculptor's most "pictorial" and "densely populated" landscapes. The beautiful world of the marsh is replete with animals and magnificent fantastic creatures, but includes no human forms. The marble of the marsh does not have any "memory" of toning, but is rich with nuances of colour. The shape of the fairies dancing in the air is conveyed through a heavier plasticity of form, while visually this mass is perceived as weightless and ethereal in comparison with the material and static world of the earth. It is interesting that the image of the marsh, as revealed through the idiom of three-dimensional shapes, triggers many more connotations with painting than with sculpture. Thus, the scholar Tatyana Galina points to some parallels between the fantasy world of the marsh with British artist Henry Fuseli's painting "The Shepherd's Dream". To others, however, its imagery is more evocative of Mikhail Vrubel's "The Pearl". 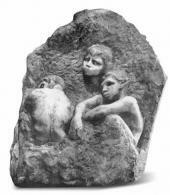 In her marble high relief "Music and Lights in the Distance", the shallow limestone relief "The Spectacle", and the marble "Distance", the sculptor moves further away from narrative. Here, the landscape is used mainly to set the mood; it is something unknown and alluring, something born of the imagination. Revealed in their diverse reality, sculptural volumes send the impulse to develop the rest of the envisioned space, as they simultaneously influence the viewer with the same force that a space left intentionally empty in a painting or drawing has on his or her imagination. Notwithstanding the illusion of "rupture" into the space, the hard material (marble and limestone) does not lose its bulk and innate heaviness, and does not de-materialize. As in many other of Golubkina's works, the title contributes to the advance of creative thought. Among Golubkina's reliefs, her limestone low reliefs represent a distinct tendency: there are eight of them in all, executed in 1912-1913. While the sculptor saw the pliable clay, with its living, tremulous texture, as the embodiment of the ultimate beginnings, and called marble "a king next to plaster", there is no doubt that limestone was for her the material of discourse, which expressed most keenly Golubkina's affinity to the "open chronology" of world art - even though the she never copied or borrowed from the works of the ancient masters. Golubkina was very well acquainted with Assyrian and Egyptian art, and during all her three trips to Paris and her visits to Berlin and London, she seriously studied the first-class collections of antiquities at the Louvre and in the British Museum. Later in life, in Russia, she attended lectures by the Russian Egyptologist Boris Turaev, the future curator of the Museum of Fine Arts. Golubkina was well-versed in the structural tenets of ancient reliefs, and admired their architectonics and bold composition of forms. 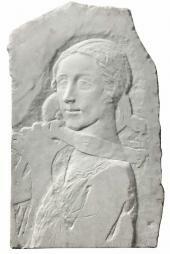 However, in her own limestone reliefs she showed an entirely fresh approach to reaching her artistic goals. Without losing the sacred aura of the ancient material, the sculptor used practically all the technical and artistic means discovered and mastered by the Egyptians and Assyrians, but created an absolutely new artistic space with her reliefs. 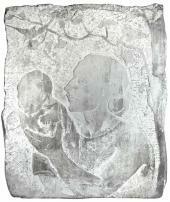 She used different expressive means in each of her reliefs, while experimenting with the intensity of background (smooth, trembling, mixed, raised, recessed), the quality of contour (recessed or embedded, en creux, carved, hatched, rounded, sharp, fluid, irregular, and others), toning and number of planes. Her refined relief "The Lady" is a good example of a powerful discourse of the still, almost naked body, and the inner movement. 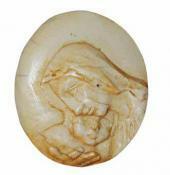 The meticulously crafted image is set against a trembling background expressively carved with a toothed chisel. In the unrestrained and emotionally charged "The Spectacle", the viewer's gaze sweeps over the hilly landscape of the outline of the characters' backs and turns into a deep thought that follows their collective gaze. While the sculptor seldom used toning for her marble reliefs, colour became an important component of her limestone works. 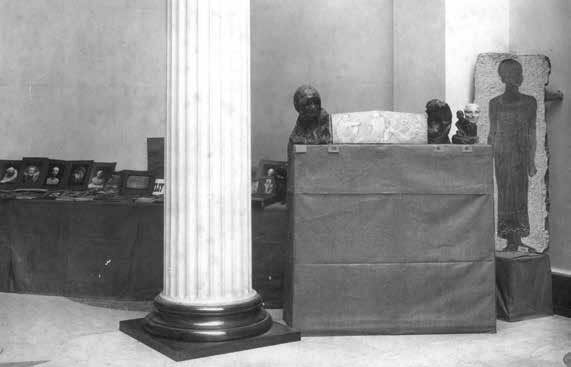 We believe that Golubkina originally painted her limestone reliefs with contrasting colours and outlines: photographs from her 1914 personal exhibition in the Museum of Fine Arts (now the Pushkin Museum of Fine Arts) are the first ones to testify to this. The techniques the sculptor used when she worked with the painted surfaces of some limestone reliefs are somewhat reminiscent of the traditional techniques of the ancient sgraffito, and even lino-cut printing ("The Spectacle" and the lost version of "Sandra Moissi"), which gained great popularity in the 20th century. Unfortunately, Golubkina did not talk much about her art; whatever she said about such iconic and significant reliefs as "The Swimmer", "The Last Supper", and "The Spectacle", and "Motherhood" is practically unknown. One hundred years later, we continue to mine "the sub-soil" of Golubkina's art and translate into modern terminology her multi-faceted, rich and coded images, which stem from her complex, synthetic worldview and the demands of a momentous time in history. They are seen as true revelations and the sculptor's last will and testament. Golubkina's relief "The Last Supper", after a lifetime that had been anything but simple, remains a mystery to this day: it is forever preserved in plaster, this material of "eternal plagiarism", not in noble and warm wood, even though through no fault of the sculptor. The melting of the sculptor's own contemplations and Leonardo's ideas, of the ancient Russian tradition and the pursuits of modern art, resulted in an admirable sculptural image that does not rely on the Renaissance tradition of pictorial, perspective-based space, though it does allude to it. Neither does it turn to the descriptive part of the Gospel narrative - instead, it clearly points to the very essence of the event. This may well be the only relief among the multitudes of sculptural representations of the Last Supper in world art that reveals the subject's timelessness and non-spatiality through both pictorial and three-dimensional means. The fact that the sculptor "combines" two distinct events in this work, the Agony in the Garden and the Last Supper, is acceptable in the icon-painting tradition, but can be found exceedingly rarely in sculpture. Golubkinas's last relief "Motherhood", which she executed in 1925, remains equally mysterious. It is symbolic that the sculptor's journey into the art form of the relief concluded in this most important and deeply felt subject - from the theme of a woman who is a family captive ("Captives") to the image of a woman who has realized her holy mission. 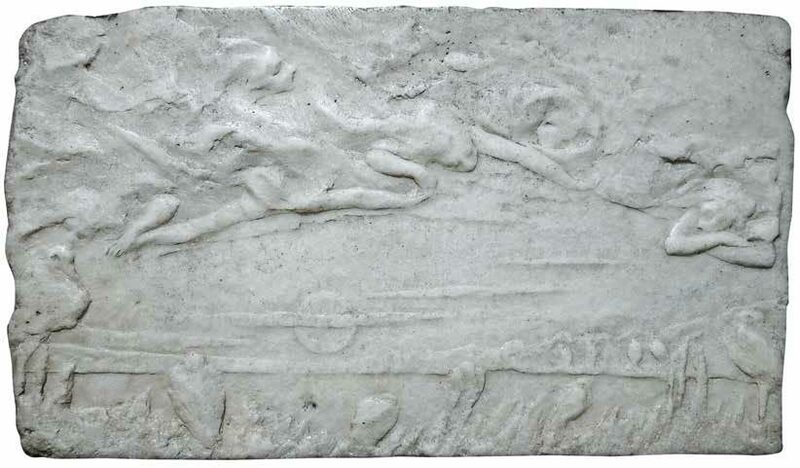 In keeping with the form-creating task, andjustified by the complexity of the image, the snow-white marble relief brings together in harmony the perceived non-finite, the pictorial and sculptural sfumato, and the uncommon style of the en creux contour; at the same time, it creates vague allusions to many works or art - first and foremost, to the images of the Madonna in reliefs by Donatello, Desiderio, and Michelangelo. 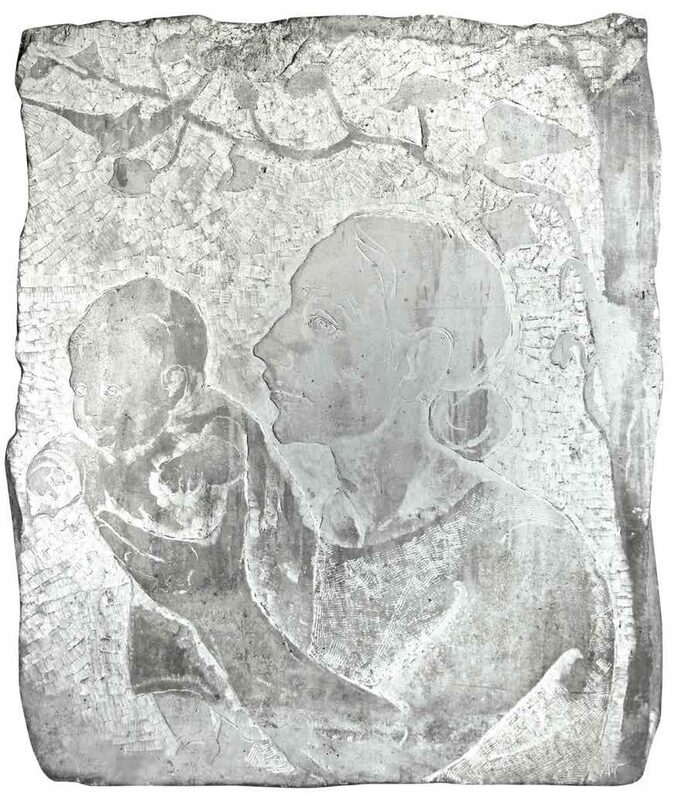 That said, it seems that the figure of the mother in Golubkina's "Motherhood" is based on a non-material image, more likely imagined in the weightless silhouette of the child, barely traced with thin lines. One critic has written: "The general atmosphere and development of Russian art at the end of the 19th century, and of painting in particular, contributed to the fact that Golubkina aligned herself with the pictorial approach to experiencing the relationship between sculptural form and surrounding space. 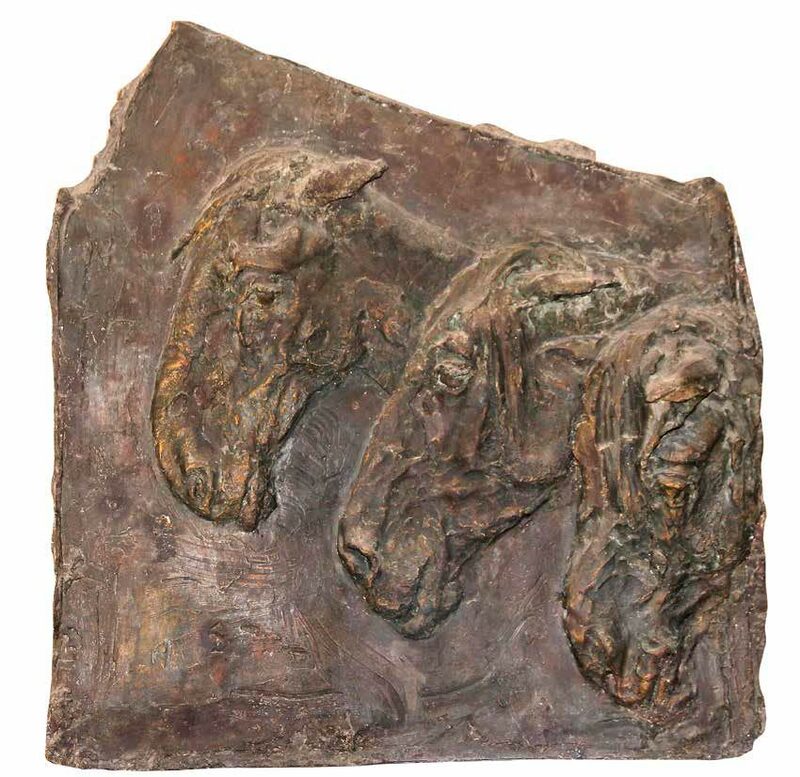 "5 Nevertheless, the sculptor's fascination with "pictorial" relief did not get in the way of her overcoming significant hurdles; more than that, she found ways to create art in quite unexpected forms, to use new materials, and to experiment with new techniques and technologies. A solid classical training, combined with the free and bold exercise of the artist's will, and her sensitivity to the changes that the new historical period brought with it, allowed Golubkina to overcome the challenges of that transitional era and become one of the pioneers of Russian modern art in the 20th century. A.A. Kamensky, A. Golubkina. The Person, Her Time, and Sculpture. Moscow, 1990, p. 174. A.S. Golubkina, Letters..., p. 331. O.V. Kalugina. Russian Sculpture of the Silver Age. A Journey from St. Petersburg to Moscow. Moscow, 2013, p. 185. (1903, tinted plaster) by Anna Golubkina over the front door of Moscow Arts Theatre in Kamergersky Pereulok. Current photograph. Marble. Detail of N. Fetter’s tombstone, at the Vvedenskoye cemetery in Moscow.